40″ discharge height with 27” reach. Control Link™ Rotation System (U.S. Patent #6769857) delivers 180° pivot carriage rotation with unmatched control. Lift & Seal System™ hydraulically seals drum to electro-polished stainless steel pour cone. Integral pour cone dust cowl allows any dust to be withdrawn as drum is lowered from cone. 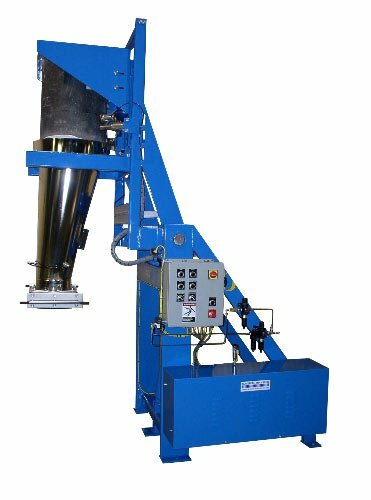 Unit includes a dual pneumatic drum impactor system to help remove material from the drum interior walls. Pour cone includes three (3) fluidizing pads. 10” diameter manually actuated slide gate at pour cone discharge. Digital pressure switch on drum seal circuit. 3 GPM hydraulic system housed in an enclosure.